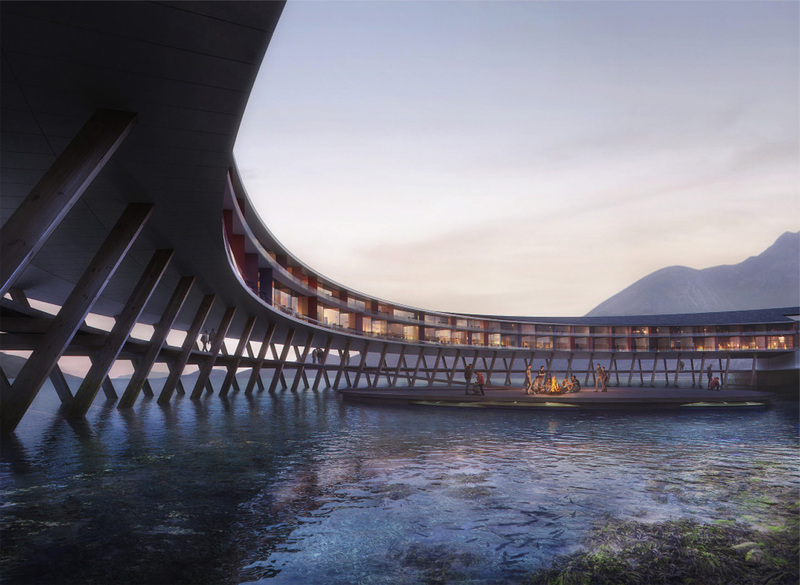 Snøhetta has unveiled plans for one of the most mind blowing hotels – “Svart” — the world’s first energy positive hotel concept above the arctic circle. 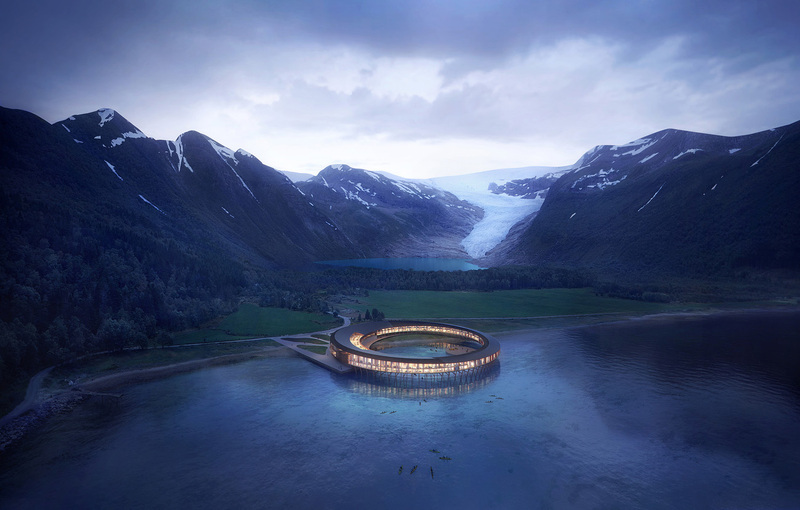 Not only does the design reduce its yearly energy consumption by approximately 85% compared to a modern hotel, but this arctic circle hotel also produces its own energy. The building extends from the shoreline by the foot of Norway’s Almlifjellet mountain and into the clear waters of the Holandsfjorden fjord. The circular shape provides panoramic views and offers a direct connection with the natural setting. The hotel’s construction references the region’s vernacular architecture in the form of the ‘fiskehjell’, (an A-shaped wooden structure used for drying fish) and the ‘rorbue’ (a traditional type of seasonal house used by fishermen). 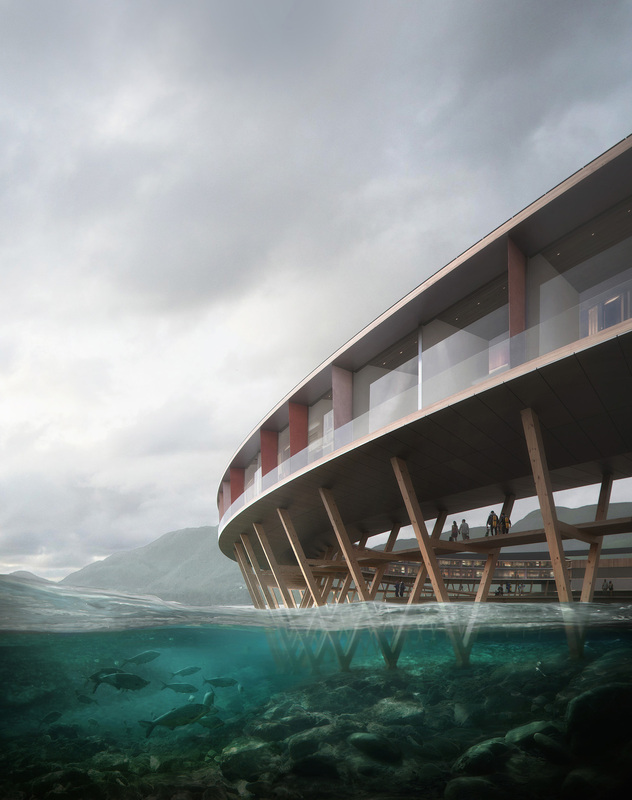 The rorbue reference translates into the hotel’s supporting structure, which is built from weather resistant wooden poles stretching several meters below the surface of the fjord. The poles ensure that the building physically places a minimal footprint and gives the building an almost transparent appearance. In summer, the poles of the hotel double as a wooden promenade, while during winter, the same boardwalk can be used to store boats and kayaks. The area surrounding the hotel can only be accessed by boat and there are also plans to introduce an energy neutral boat shuttle from the nearby city of Bodø to the hotel. From an environmental perspective, a number of strategies have been employed in order to ensure that the hotel is energy positive. Firstly, Snøhetta conducted an extensive mapping of how solar radiation behaves in relation to mountainous context throughout the year to optimize the harvest of energy. The result of the study has been an important premise for the circular design of the hotel, and both hotel rooms, restaurants and terraces are strategically placed to exploit the sun’s energy throughout the day and seasons. Meanwhile, the hotel’s roof is clad with Norwegian solar panels produced with clean hydro energy reducing the carbon footprint even further. Because of the long summer nights, the yearly production of sun power will actually be higher than the amount of energy you would harvest further south. The façades protect against insolation from the sun in the summer when the sun is high in the sky, removing the need for artificial cooling. During winter months, when the sun is low in the sky, large windows allow for a maximum of insolation to exploit the sun’s natural thermal energy. Materials with low embodied energy have been utilized throughout the scheme. The use of wood in construction and cladding minimizes the environmental impact of the building, and typically energy-intensive materials such as structural steel and concrete have been avoided as much as possible. The hotel also uses geothermal wells that are connected to heat pumps. These are used to heat the building, thus reducing the building’s total energy consumption. At the moment this hotel is just a concept but once it’s built it could become one of the most unusual hotels in the world.